It turns out that Yogi Bear and ants are not the only things to fear when heading outdoors for a picnic lunch. During summer heat waves, you need to be concerned about food safety, too. Typically, cooked food is safe to leave out at room temperature for up to two hours, Lifehacker reports. Beyond that, it should be kept out of the “danger zone” of 40°F to 140°F by being either refrigerated or kept hot using a heating source: This keeps bacteria from thriving. But food left outdoors on a warm day (above 90°F) chops that rule in half. Food only has about an hour under the Sun before bacteria like Salmonella and Staphylococcus aureus begin to multiply rapidly and greatly increase your chances of falling ill. If you’ve ever felt a little green following a long afternoon cookout, this is one possible reason why. The one-hour rule applies to most foods starting at a cooked or cold-served temperature. Still, cold items like potato salad should be kept refrigerated or in a cooler until they’re ready to serve. Processed foods like bread, crackers, and other pantry-type products are generally safe to leave out. You should also adhere to indoor food safety practices, like washing your hands before and after touching raw food items or before you sit down with a plate. If there’s no running water, bring a jug and some soap or wet wipes. While packing up for a day out, put your food coolers in the passenger section of your car, not the trunk, where temperatures can cause ice or gel packs to warm up. 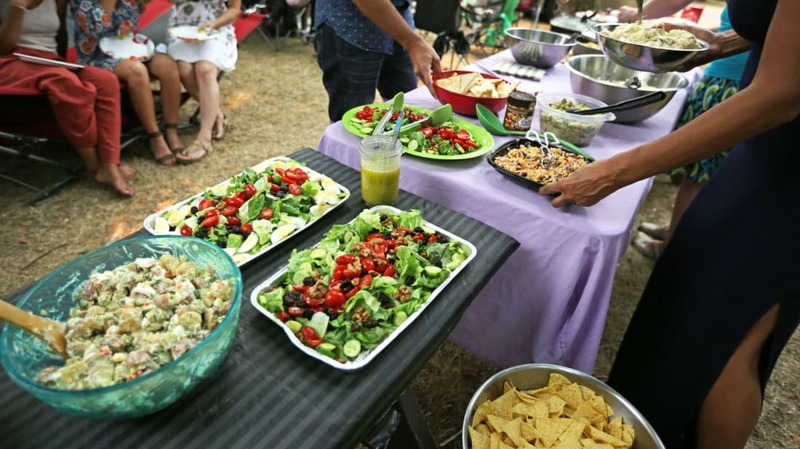 Keeping your perishable picnic food organized and stored has another benefit. If it's stowed away until you’re ready to serve, it’s less likely to attract ants that think they’ve been invited to your little gathering. It’s also a good idea to check picnic grounds or table legs for fire ant mounds—a sure sign that you’re better off relocating.